Mexico’s footwear industry is heavily concentrated in three main cities: León, Guadalajara and Mexico City. Factories and workshops in the city of León in the state of Guanajuato account for about 68% of all shoes made in Mexico. The two other important manufacturing areas for footwear are Guadalajara (Jalisco) where about 18% of the national production originates, and Mexico City (together with surrounding parts of the State of Mexico), responsible for 12%. 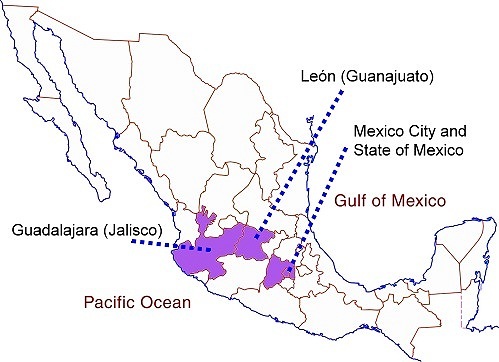 Concentration of shoe industry in Mexico. According to the 2009 Economic Census, there were close to 7500 “productive units” related to shoe manufacturing in Mexico, with about half of them located in the state of Guanajuato. In 2012, national producers turned out 244 million pairs of footwear, of which 171 million pairs (70%) were made in Guanajuato. Shoes are also an important international trade item. In 2013, shoe exports reached 26 million pairs, worth almost $600 million (an increase of 14% compared to 2012). The main export markets were the USA, Canada, Colombia, Guatemala, Panama and Japan. Mexico’s shoe industry hosts several major trade fairs each year. The single biggest event, SAPICA (Salón de la Piel y el Calzado), is Latin America’s largest international footwear trade fair and is held in León twice a year. The next SAPICA trade fair opens today and runs 26-29 March 2014 in León, Guanajuato. This show has 45,000 square meters of exhibition space, more than 2000 stands and 850 presentations. SAPICA has gained international recognition and attracts 11,000 buyers (from the USA, Canada, Europe, Japan, and Central and South America) and 35,000 visitors each year. The flexibility of León’s shoe manufacturing industry has enabled firms such as Poppy Barley (based in Edmonton, Canada) to be able to market custom-made boots via their website and without the overheads of any conventional footwear stores . Individual purchasers take their own foot measurements, and then the boots are made to order and shipped to their homes. This “made to measure digital retail” approach flies in the face of the mass production that has become the norm in the footwear industry. The Poppy Barley website includes a section devoted to its manufacturing partner in León.